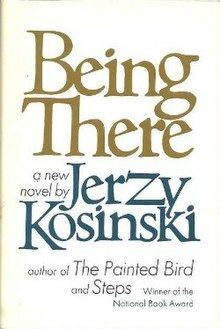 Being There is a satirical novel by the Polish-born writer Jerzy Kosinski, first published in 1970. Set in America, the story concerns Chance, a simple gardener who unwittingly becomes a much sought-after political pundit and commentator on the vagaries of the modern world. A film based on the book was made in 1979; Kosinski co-wrote the film's screenplay with Robert C. Jones. When Jerzy Kosinski published Being There – wrote historian Monika Adamczyk-Garbowska – "most Polish critics immediately recognized [his book] as a version of Kariera Nikodema Dyzmy (Nikodem Dyzma's Career) by Tadeusz Dolega-Mostowicz, a very popular novel from the interwar period, and Kosinski was again accused of plagiarism". The authorship controversy was a repetition of an earlier case, concerning Kosinski's first novel, The Painted Bird, published in 1965, which was accused of being plagiarized from a book published in the Second Polish Republic by the Polish ethnographer Henryk Biegeleisen. ^ eNotes.com, copy-paste excerpts from: 1971 and 1973 periodicals including Times Supplement (1971), Chicago Review (1973), Harper's (1973), Critique (1973), Hudson Review (1973), and Books and Bookmen (1973). Retrieved December 16, 2012. ^ a b Monika Adamczyk-Grabowska (2001). "The Role of Polish Language and Literature". The Hidden Isaac Bashevis Singer by Seth L. Wolitz. University of Texas Press. p. 137. ISBN 029279147X. Retrieved December 2, 2012. Being there / Jerzy Kosinski Catalogue of the British Library. This article about a comedy novel of the 1970s is a stub. You can help Wikipedia by expanding it. This page was last edited on 24 August 2018, at 03:58 (UTC).